When it comes to keeping tile floors looking great, the secret is in the grout. Yes, dirt can sit on the surface but generally cleaning amounts to just that…cleaning. Grout is a more involved story. When grout is kept clean, tile floors look beautiful and can last for years. However, cleaning tile and grout isn’t always as simple as you think. In fact, you may be doing things that are hurting your floors instead of cleaning and protecting them. Here are four common tile and grout cleaning myths, brought to you by the Stone Care Professionals at MARBLELIFE. Tile is a very durable flooring material, because of this many people think scrubbing with wire brushes, steel wool, and other rough/coarse implements will help break up stains. While tile is certainly durable, it is not invincible. Scrubbing with abrasive utensils can damage your flooring by leaving behind scratches, breaking and scrubbing away the sealant, even removing some of the color or pattern. Wire brushes also damage grout, breaking down the composite and creating space between the tiles for moisture and bacteria to hide, which can lead to more serious (and costly!) damages. The worst case is the fact that steel wool and other metals that rust can leave behind metal fragments that will later turn red with rust. Once this red sets in getting it out is another process entirely, and when were the cure WILL result in removing your grout’s seal. The net result being the red rust is gone, but the floor begins to absorb spills and dirty mop water and darken with dirt stains at a remarkable pace. Wire brushes are a no-no. If you feel the urge, it is a signal that its time to call in a professional to have an assessment done to define what is going on and how to get back to an easy to clean healthy floor. Only use soft cloths or sponges to clean your tile floors. For tougher stains, call a professional tile floor cleaning company like MARBLELIFE, its not just about getting the stain out, but fixing what allowed it in in the first place….as it pertains to the floor. (No comments regarding pets or family members here). Bleach has become one of the “go-to cleaners” for tackling tough stains or disinfecting “things.” When your tile is starting to look shabby with darkened grout lines (from dirt and bacteria), your first impulse may be to reach for the bleach. But don’t! Although bleach will disinfect and make the room smell “clean,” smell was never the problem. Killing stuff doesn’t mean its removed. You need a cleaner designed to remove the dirt and oils that are hiding the natural color of your grout. Then an understanding as to why it is so difficult, as this is the real story. Once understood and addressed the surface can be restored to clean with a plan on how to prevent a re-occurrence based on an understanding of what happened and the conditions that allowed it to become part of your floor. Only use mild cleansers like MARBLELIFE® Tile & Grout Cleaner, whether it’s everyday maintenance or a periodic deep clean. Just like bleach, acidic cleaners can take dirt and other grime right off tile and grout, making it seem like a good choice. But the very acid action that makes these cleaners a good choice for some situations, can create catastrophic problems downstream for your floor and your ability to maintain it in a clean condition. Acid cleaners on a marble, travertine, terrazzo, limestone or other acid sensitive surface will literally dissolve micro-holes into the surface, removing the shine, creating pockets to hold dirt, and in the worst situations leaving behind a white mark that cannot be removed without the aid of a professional who will need to polish the damage out. 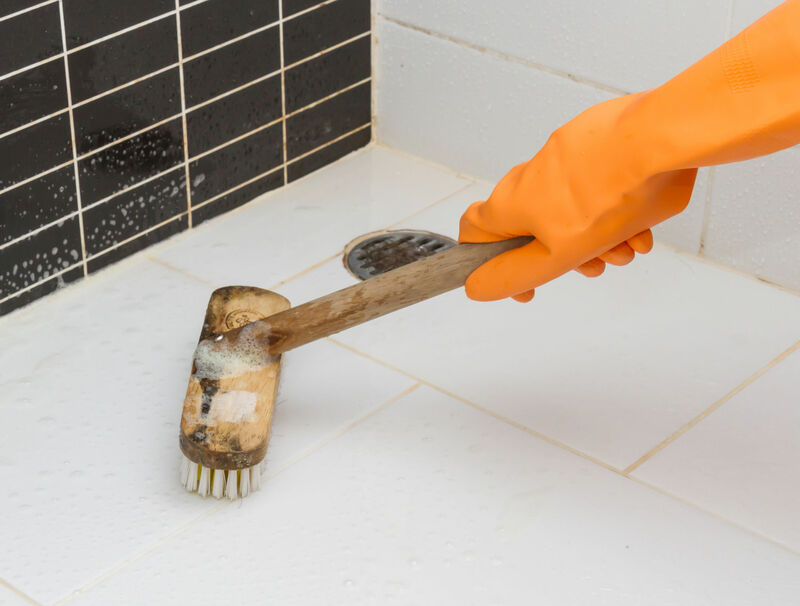 Even on tile surfaces, that are reported to be insensitive to acids, the issue appears in the grout, and specifically its ability to damage and remove grout seals. Unsealed grout allows dirt and dirty mop water to get trapped in the now open grout pores , darkening the surface in a manner that is very difficult to clean. Acid cleaners are a powerwash services friend as they provide a short-term brightening but a longterm unprotected and absorbent grout to powerwash clean unnecessarily frequently. cleaners are just as harsh and abrasive as bleach and can damage your stone. This disceptive little cleaner, creates more problems that it solves. 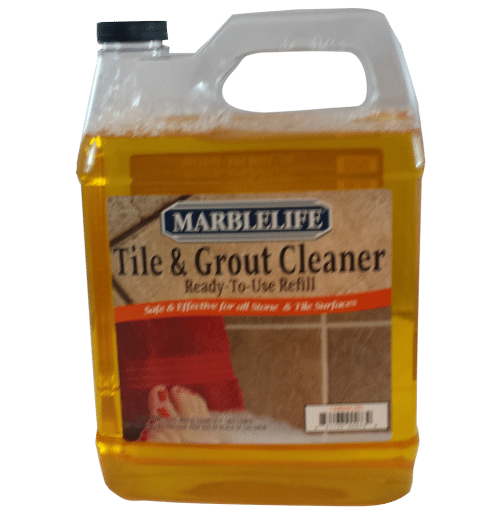 Here again, MARBLELIFE can help, by identifying the problem, restoring a clean surface, resealing your grout and providing guidance to the daily cleaners best suited to your situation whether residential, restaurant or commercial. Save yourself some future agony and stick with a mild cleanser to clean your tile. You should be able to maintain your floors with a damp mop to pick-up debris without puddling them floor. If your floor has reached the point where you are considering powerwashing, its is a signal you have something more serious going on. Even if you momentarily improve the situation it will return as the root cause has not been dealt with. This brute force solution is generally desperation talking. Here again, the professionals at MARBLELIFE have the proper tools and cleaners to lift deep stains out of tile and grout without damaging your surface. More to the point, their guidance and review is FREE, so you can still powerwash to your hearts’ content after they have explained what has happened, but generally you will find a path to a solution that also includes a permanent end to needing a powerwasher. With nothing to lose this should be a sign its time to get help. (Of course, if you just got a powerwasher – we get it – its fun to see that change in appearance and fulfilling when done). We apologize If we are about to curb your fun or make your powerwasher a little lonely, but we expect more time with the family or watching the game may be your reward. If your tile looks dull or discolored, call MARBLELIFE Stone Care to schedule your professional tile and grout cleaning from the stone care experts themselves. For any other questions regarding tile and grout maintenance, contact your local MARBLELIFE office and knowledgeable stone craftsmen will be happy to assist you.